If you fancy immersing yourself in the ‘Futurist’ (aka New Romantic) club scene of the early ‘80s you might like to read my new novel, just published for Kindle. It’s called ‘Killers In Mascara’ and it’s the first of a series. New Year's Eve, London, 1979. In the exclusive Spivz nightclub the city's trendiest trend-setters prepare to drink and dance their way into the new decade, unaware that a killer is in their midst. When the dead body of a young man is discovered, there is no motive and far too many suspects. But there is one deadly clue - a bottle of mascara. The hunt is on: "Find the mascara and you find the murderer!" 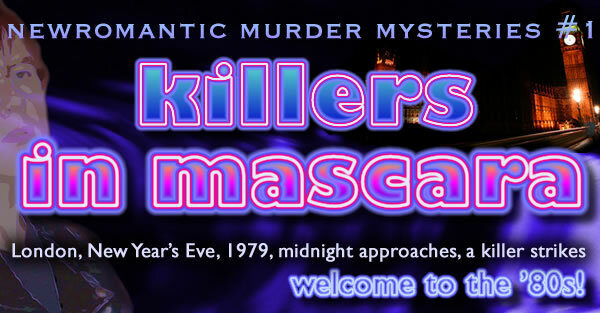 Killers in Mascara leads the reader on an extraordinary journey into a decadent and glittering subculture where even killers do it with style! Anyway, it’s available for immediate download from Amazon USA and Amazon UK at the bargain price of 99 cents/70p. If you grab a copy, read it and like it, suffice to say I’d be most incredibly grateful if you would write a review on Amazon. The Dark Neon web site (which used to contain my old interviews with 80s pop stars has now been changed to provide more info on my books – and you can also download a map of the murder scene). Meanwhile, the 80s interviews have been moved over to their own area of the 80s Empire web site.